There are some simple guidelines to running any MLM or home based business opportunity successfully. The guidelines help you see more success every day, and let you run your distributor business as it should be – like a business. The faster you build your MLM leads list the more successful you will be. This guideline is accurate in two ways when it comes to your success. 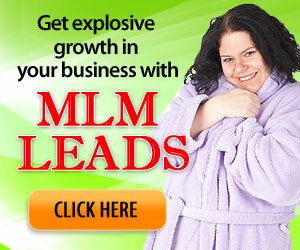 First, if you have a MLM leads list to call then you can begin calling right away. Secondly, being able to create a list of leads interested in work at home opportunities shows that you have the right contacts for this kind of industry. The warmer your MLM lead is the bigger chance you will have to enroll them into your downline. A warm MLM lead is someone who has shown an interest in running a home based business. Generally a warm network marketing lead has already convinced them self that a home business may be a way to reach their goals. It is much easier to recruit a warm MLM lead then a cold lead that has no interest in running their own home based business. Do a little each day to improve your MLM business. Pay attention to this one as it is crucial advice. If you take 1 hour a day and work on your MLM business you will continually see improvements. Ensuring that you work on your business every day makes it a priority and stops you from ignoring it in favor of something else. There will always be something else that can be done, but if you don’t work at your business it will never grow. These are pretty simple but important guidelines that every MLM distributor could use. Following the advice of these guidelines would mean that you will want new work at home business leads every day, you would want your MLM leads to be warm leads, and you would want to call these home based business leads every day to improve your downline. Well, as luck would have it there is a MLM Lead that listens to these guidelines! It’s called a ‘Daily Lead,’ and as the name suggests it ensures that you receive new fresh MLM leads every day so you can work on expanding your downline. Truth be told I’m sure that it wasn’t luck that formulates this awesome winning combination of business sense and the MLM Leads industry. Daily Leads work in a pretty easy format. When you place your order online with your MLM Leads Company you can tell them how many leads you want sent to you each day. Then you are sent that many fresh leads every day until your order runs out. It’s that simple! All you have to do is be sure that you are following those 3 guidelines and working on expanding your downline every day. Remember that a MLM lead is like toast – the longer it sits unattended the colder it gets.